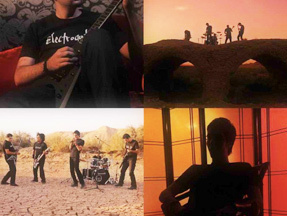 Electroqute is a Metal band from Tehran, formed in 2007. Band members: Amir Vafaei. Mehrdad Rahmani. Behruz Borujerdi. Reza Gholami. MohammadReza Tatari. History: Amir started his cooperation with a rock band with some musicians from west of Tehran in 2005. But a professional band was not formed Because of different reasons. Until Amir decided to compose and mix his own songs and gave it a second try and offered Mehrdad, who he had met only few times in the studio, to join the band as the lead vocal. Behrooz, Reza,MohammadReza, all of whom were Amir’s friends, then joined the band. They started the recording and mixing on Mehrdad’s lyrics in Rock Iran studio and formally formed the ElectroqutE in 2007.